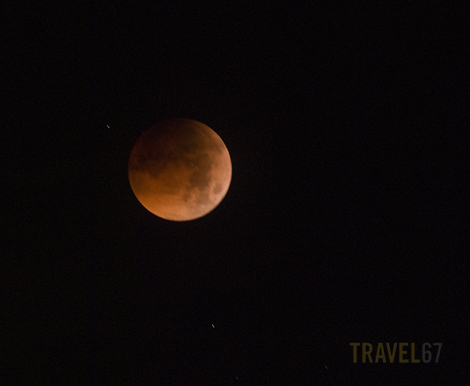 Got up at 3.30AM and drove over to Cape Maeda to watch the Lunar Eclipse. My plan was to photograph the moon reflected in the ocean as it neared the horizon, but this wasn’t possible due to clouds on the horizon. The image above is not a particularly interesting shot, (nothing to put the moon in context) but is a decent enough snapshot to remember the event. I was pleased that most of the sky was clear so I could at least witness the lunar eclipse. This is in contrast to the solar eclipse a few years ago when, having travelled all the way to Yakushima to be in the zone of totality, we spent the entire day under a thick layer of rain clouds. Do you do much night photography? I see you have a light painting seminar coming up, but I would think Okinawa would be a great place for natural light night photography as well, with the ocean and the uninterupted horizon for stars. I haven’t done much night photography, but I have thought that Okinawa has a lot of potential. This was one of the reasons that I’m bringing Trevor Williams down to Okinawa to teach the class. With our new skills we should all be able to go out and capture Okinawa at night!